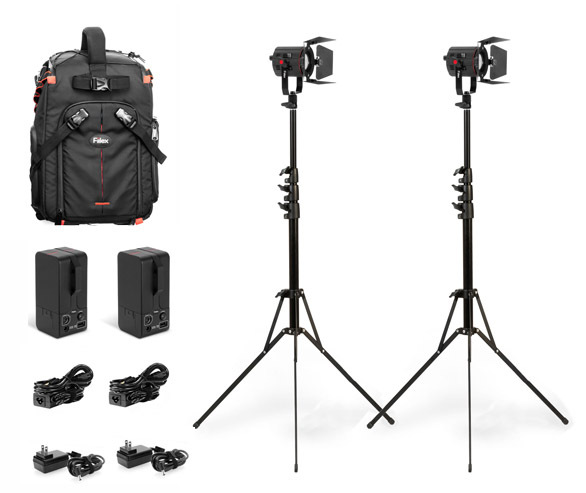 San Francisco, CA -September 21st, 2015 - Fiilex, a leader in LED lighting for the broadcast, film, and photo industries, announces the release of two P180Es mini interview kits, the S282 and S284, with Fiilex agility backpack. The P180E, an ultra-compact LED light that provides 200W of tungsten equivalent output with a 40W draw. Dynamic color tuning between 3000K to 5600K lets users match light temperature while the single source LED offers a hard light that can be cut, shaped, and modified. Complete in the custom-made Agility Backpack, The S282 and S284 feature 6 configurable compartments to store lights, camera backs, lenses, and more. They also provide room for accessories like audio mics and power cables, as well as a protective pocket for a 13" laptop. Tripods and light stands mount to the front and sides of the pack, allowing for a mobile, professional set-up. With the all-weather cover, the kits provide users the most protective delivery over all rough terrain. "We are always redefining a kit container at any location for our end-users" Says Brent Siebenaler, Brand Manager of Fiilex. "The durable liners give users the most expanded room usage and with the excellent CRI (≥92), the Fiilex P180Es give videographers clean, color-accurate images. " The S282 All-Weather Mini Interview Kit is a portable kit that features two bright P180Es for a total 400W equivalent output. In addition to being IP-24 weather-resistant, the P180E features high CRI that brings color to life and the dimmable, color tunable light makes those indoor/outdoor transitions seamless, matching to daylight or tungsten sources with just the turn of a dial. 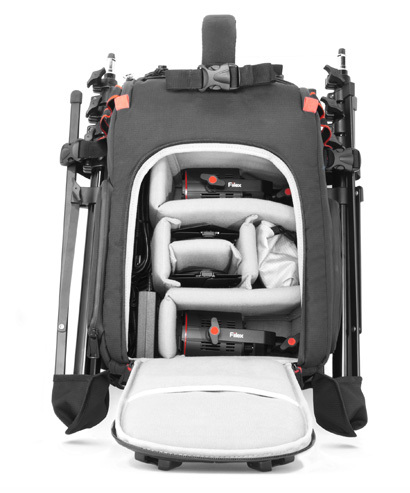 The S284 packs two P180Es and two B60s into the extremely portable Fiilex Agility Backpack. The P180Es are both dimmable and color-tunable, giving videographers the freedom and control to match ambient color temperatures in almost any setting. The included B60 Brick Battery Systems provide each P180E with over 90 minutes of power and feature USB output for charging mobile devices and tablets. The S282 comes in Fiilex Agility Backpack with two color-tunable P180E light heads, power adapters, barndoors, light stands. The U.S. retail price is $1245.00. The S284 comes in Fiilex Agility Backpack with two color-tunable P180E light heads, B60s ,power adapters, barndoors, light stands. The U.S. retail price is $1895.00.